Millet School’s 14th Annual Christmas Giving project was another huge success! This year we were happy to support the local Millet Food Bank. The Grade Four students were excellent PAX leaders as they helped to organize this year’s project in their Health class. PAX leaders strive to help themselves be better individuals and make the world a better place. We collected food and cash donations throughout the month of December. Our goal was to collect enough food to, “Fill the front of our school office.” Thanks to the generosity of Millet School students, families, staff and community members we surpassed our goal! On Friday, December 19 at our final performance of our Christmas Concert we presented 643 pounds of food and $637.60 in cash donations to the Millet Food Bank. Thank you to everyone for supporting our Christmas Giving project as we help our students understand the true spirit of Christmas. 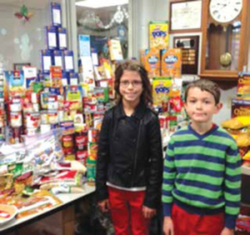 Pictured: Isabel Turgeon and Jack Szigli from the Grade 4MC class at Millet School are just two of the students involved with the Millet School’s annual Christmas Giving Project which supported the Local Millet Food Bank this year. Photo submitted by Susan Coleman, Vice-Principal of Millet School.